The principal organs report to the General Assembly every year on their work during the past year, as mandated by Article 15 of the UN Charter. The annual reports of the Secretary-General, Security Council, Economic and Social Council and International Court of Justice offer excellent starting points for research. These reports are supplements to the General Assembly Official Records (GAOR) for each session. The last report of the Trusteeship Council included as a supplement to the GAOR was in the 30th session, covering 1974-1975. Prior to the 31st session, documents were sequentially numbered. The supplements to the Official Records were renumbered for each session. For example, document A/9601, the report of the Secretary-General on the work of the organization, was Supplement 1 to the Official Records of the 29th session. 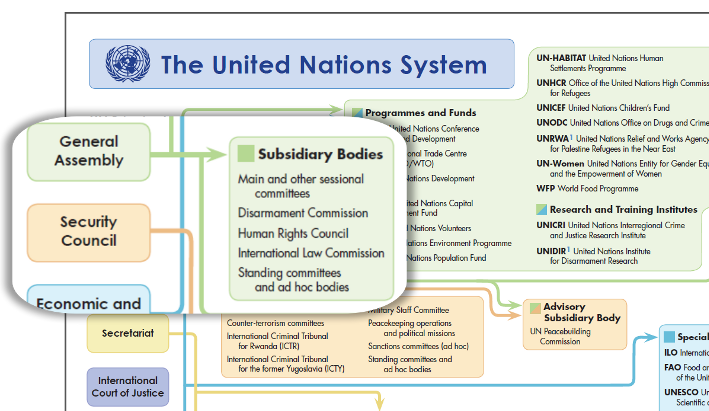 There are many subsidiary bodies of the General Assembly that work on particular topics. Reports of subsidiary bodies of the General Assembly are issued as supplements to the General Assembly Official Records (GAOR). They have a regular symbol pattern that corresponds to the supplement number for the body. The report of a subsidiary may forward draft resolutions or decisions recommended for adoption by the General Assembly. Prior to the 31st session, documents were sequentially numbered. However, the supplements to the Official Records were renumbered for each session. For example, document A/10011, the report of the Committee on Contributions, was Supplement 11 to the Official Records of the 30th session.